We’re starting a new year of ballet with babies. And the first “theme of the month” I’d like to explore is, quite simply, why are we doing ballet for mums. What are these classes for? 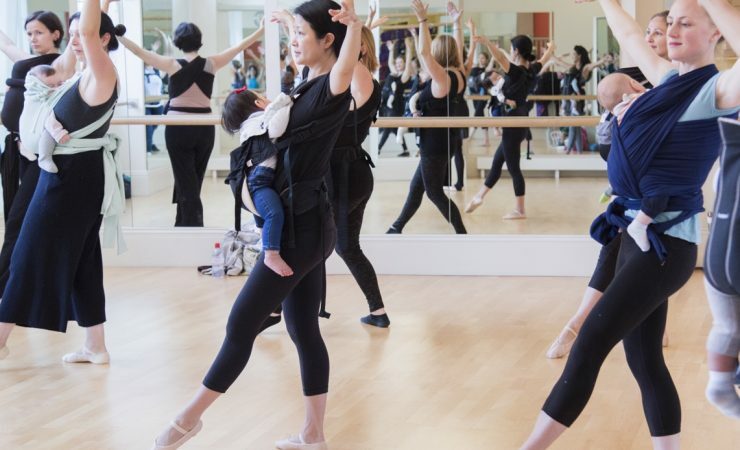 Ballet could be the start of a wonderful bond with your baby. When you’re moving your body on music that makes you feel good, and you have your baby close to your heart, all your “feel-good” sensations are transmitted to your baby, in your womb or through the skin-to-skin connection on the sling. Rhythm and energy, creativity and expression, passion and freedom are all offered to your baby through your ballet movements. You’re transmitting to your baby a sense of security and serenity: your baby feels safe and protected, being held in your womb or close to your heart, feeling your positive emotions and sensations. You’re dedicating time for yourself and your baby only – switching off from anything else happening outside of our studio, this is the time for YOU, and your baby. You’re bringing awareness to your body and allowing yourself to follow its wisdom and intuition. Ballet connects body and mind. Allow them to inspire you in your motherhood journey. You’re sharing emotions not only with your baby: when you take a group class you meet new friends. Meet someone while dancing means meeting them in their soul. Ballet, and dance in general, have the ability to influence our mind, our body and our spirit. It doesn’t matter the level of ballet experience we have, if we do it for passion or for work. And if you too, as myself, believe that whilst you’re dancing with your baby, you’re creating the base for a loving, respectful and compassionate life for your baby, come and enjoy our pregnancy and mum&baby ballet classes! And then, share the love inviting your friends to join the Ballerina Mums Community on facebook and instagram ! I can’t wait to seeing you all again!